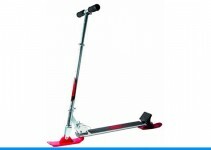 To go with your other castle kit, you now have a fairly involved add-on. This LEGO kit has the flying Ford Anglia (Harry and Ron, watch out! ), the Whomping Willow, the dorm room of Ron and Harry, Professor Snape and his Potions office, as well as Argus Filch, Seamus Finnigan, and the Owlery so that Harry can send Hedwig for help! 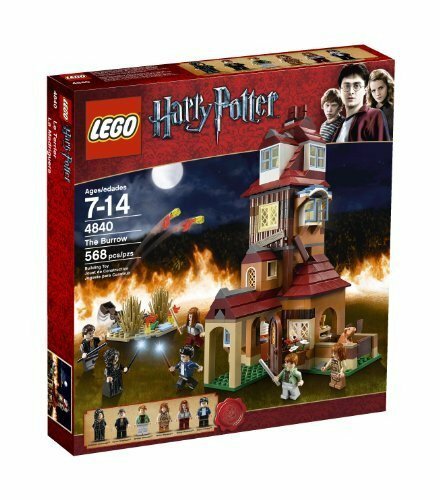 This is a great addition to the other castle kit and it allows you to play out the Chamber of Secrets scenarios and some of the Prisoner of Azkaban scenarios. Potions are also included in this kit so that Hermione can sneak into Professor Snape’s potions office and steal some ingredients to make her legendary Polyjuice Potion. The Whomping Willow spins around to toss the flying Ford Anglia about and the trunk of the car comes open so that Harry and Ron’s trunks can come flying out before the car disappears into the Forbidden Forest. Hedwig is included so that she can nestle comfortably in the Owlery while Harry and Ron run around on their adventures. The Chamber of Secrets story would not be complete without Aragog and all of his furry-legged descendants. There are no butterflies for Ron as he and Harry entangle themselves in the massive web of danger that is Aragog’s Lair. 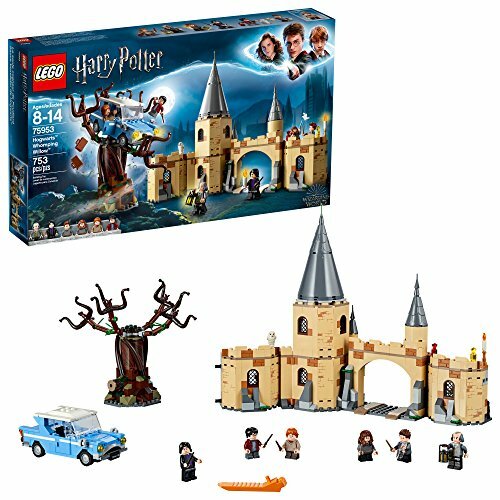 Mini-figures for Harry and Ron are included, as well as wands, a candle and a lantern to navigate the Forbidden Forest. Harry and Ron are in their street clothes because they are hiding outside of school boundaries in the middle of the night. A tree is included, complete with leaves and branches, as well as many spiderwebs. Aragogs descendants are also included, just to make Ron’s nightmare just a little more real. 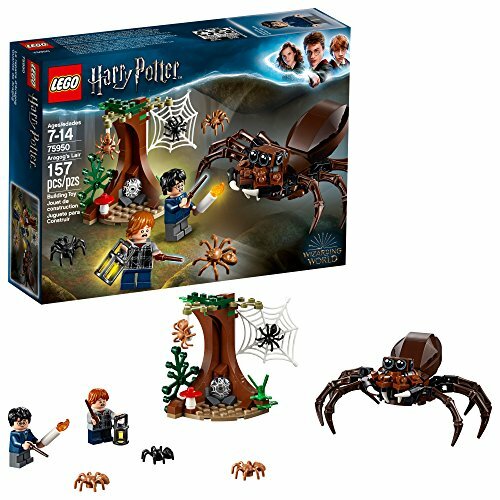 The tree comes with a really cool shootable action which allows you to shoot spiderwebs at Aragog and his many, eight-legged children as you are helping Harry and Ron get away. The figure of Aragog is buildable so you get to put him together and the joints for his body and legs are movable, so you can make him really creepy as he waits in his lair for the boys. Aragog’s fangs also move, so you can make them hiss and pinch at Ron while he’s successfully escaping. Gellert Grindelwald exchanges lightning blows with Seraphina Picquery. He runs out and gets in his magnificent black carriage. The huge black carriage is being pulled by a thestral, a skeletal, winged horse that you can only see if you have also seen death. 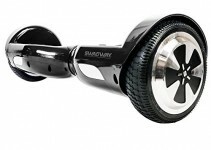 The ride through the night sky is dark and wild and brutal. The escape plunges the entire world into fear and terror and only one man can save them. Albus Dumbledore. 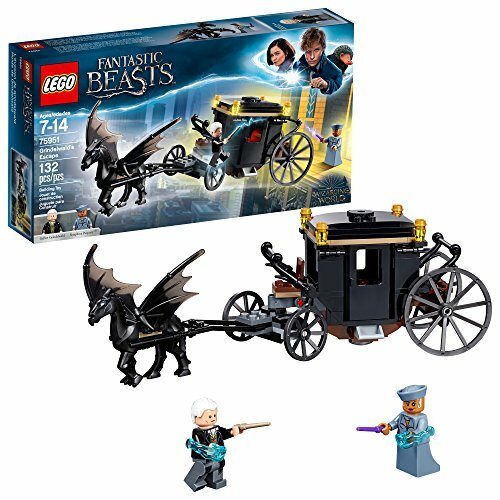 With this LEGO set, you can go see the movie, “The Crimes of Grindelwald” and reenact his magnificent and darkly wild escape right afterward. And you don’t have to worry about not being able to see any thestrals. The winged horse included in this kit is visible to everyone. The wings are even hinged, so you can move them up and down as you fly Grindelwald and his carriage through the wild, night sky. Included in this kit are the mini-figures of Gellert Grindelwald and Seraphina Picquery. The figures have both wands and lightning rays on their hands so that you can reenact every bit of that glorious battle. One of the best things about Fantastic Beasts and Where to Find Them is Newt Scamander’s magical case full of weird and unusual magical creatures. 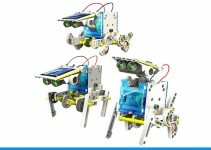 This magnificent LEGO kit comes with mini-figures of Queenie, Tina, Newt, and Jacob. The case itself, once completed, will unfold into an amazing office and animal shelter, complete with a large number of creatures, three of them buildable, so you can assemble them yourself. A niffler and bowtruckle are also included as small figures. The wings of the Occamy and Thunderbird both have hinges so you can fly them around or pose them in frightening figures for your mini people to admire. The head and legs of the Erumpent are also movable, so you can walk him around or even pose him rising up on his hind legs. Weird plants can greet Newt as he works in his laboratory and the Thunderbird watches from overhead. Your niffler will even have three pieces of gold to sniff out and play with while your other figures are hard at work and play. We’ve all heard the amazing chatter about Quidditch and been right there in the air with Harry as he plays his heart out. Now, we can control the game in every possible way. 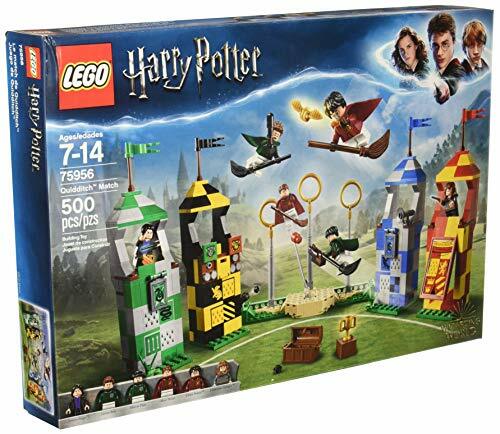 You can play your own Quidditch matches with the new LEGO Quidditch building kit. It comes with four raised stadiums for every house to be represented in the quest for the House Cup. Each house stand has its own unique functions, so you can really get into the amazing secret parts of the house stadiums. 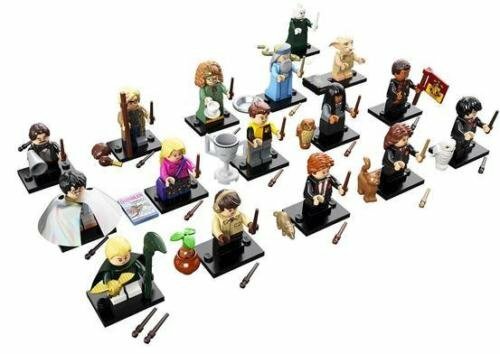 The mini-figures included are Snape, Lucian, Marcus, Oliver, Harry, and Hermione. Everything you need for a Gryffindor versus Slytherin match to the death! Broomsticks for all of your figures are included and the banners of the playing houses can be slid in and out of the holding pieces. A little mini LEGO shooter (that really works!) 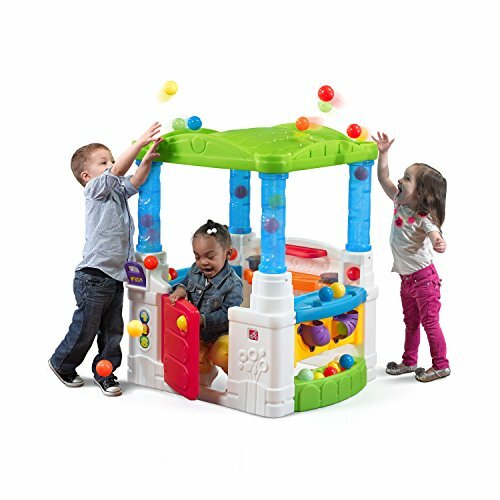 will shoot Beater balls at your players and a swinging stand will make sure that all three of your goal hoops are being properly guarded by the Keeper of your team. A red Quaffle is included and the Slytherin stand even has a tiny function so that you can cause Severus Snape’s robes to catch fire just like in the real book and movie. This amazing set has everything you could possibly need to visit the Weasleys at the Burrow. You can reenact every single book and movie and you have all of the characters necessary to do so. This particular set comes with some exclusive figures, as well, such as Bellatrix and Fenrir. Molly and Arthur Weasley are also include, along with Ginny Weasley, Harry, and the family pig. The entire set is amazing is also set up to depict the last major scene at the Burrow, the attack of the Death Eaters and the explosions in the field. Molly’s clock and her table of abundant food are included, as well as there being two rooms, Ginny’s room and Ron’s room. Hedwig and Harry’s truck are there, as well as Ron’s brightly colored blankets depicting his favorite Quidditch team, the Chudley Cannons. The Daily Prophet and the Quibbler are both ready for Arthur to read at the kitchen table. The explosions in the field are included, as well as the fireplace where everyone can get through the Flue Network. This set is amazing. 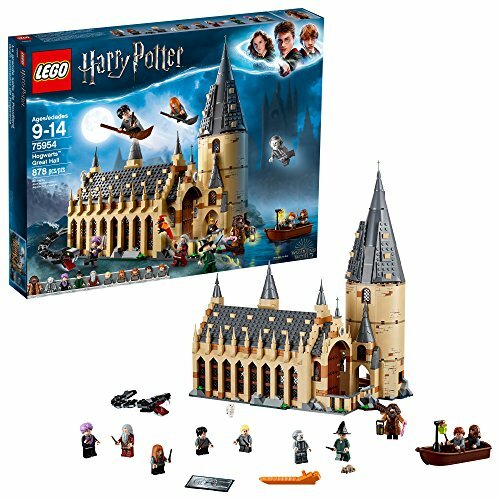 This set comes with 22 figures for a Lego set and all of your favorite characters from both Fantastic Beasts and Harry Potter. Newt Scamander from Fantastic Beasts, along with all of his friends is in this set and you can use the Fantastic Beasts characters to fully embrace and complement the Case of Magical Creatures above. 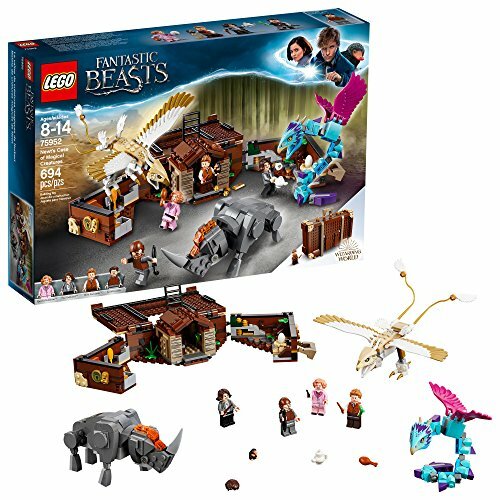 All of the main characters from Fantastic Beasts are here and your new Lego friends can take care of the Occary and the Thunderbird together! 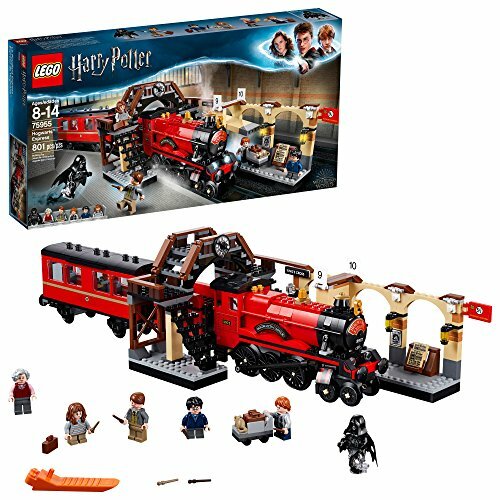 Some extra characters from Harry Potter are also included in this set, including the Trolley Witch from the Hogwarts Express train. 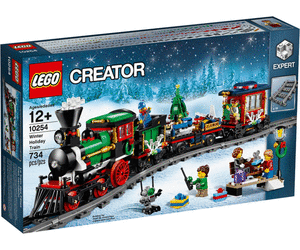 She is included along with her tray of Pumpkin Pasties for the witch and wizard children on the red, shiny train. Newt Scamader even comes with his own Niffler. 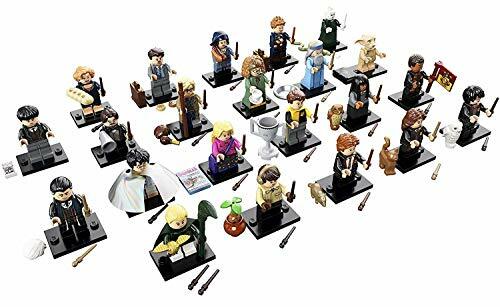 The main characters from the Harry Potter films are also all included, complete with small items which personify and identify each character. Luna Lovegood comes with her own copy of the Quibbler and Cedric Diggory comes with the Goblet of Fire from the Triwizard Tournament. This is your basic set of Harry Potter characters, but everyone is included! Lord Voldemort with his snake, Hermione with her cat, Crookshanks, and two figures for Harry. One of them is Harry with his Invisibility Cloak and one of them is Harry with his pet owl, Hedwig. Ron comes with his rat, Scabbers, and Neville Longbottom comes with his beloved plant, the Mimbulus Mimbletonia. Draco Malfoy has arrived in his Slytherin-green Quidditch robes and his broomstick and a Golden Snitch. Albus Dumbledore comes with his own Pensieve so that he can collect his memories and relive them one by one. That’s amazing! Dobby is included, of course, along with the book he received his sock in, and Mad-Eye Moody comes with a flask of Polyjuice Potion and interchangeable dark hair so that he can become Barty Crouch, Jr. And no set would be complete without Professor Sybil Trelawney, the spacey Astrology teacher who has only made two accurate predictions in her entire life. She comes with a teacup and saucer. Tiny Professor Flitwick is there with a megaphone so that he can be heard over all of the rabble in his classroom.